Treasure Tides is one of the expansion farm and one of it’s main crafting building is the FarmVille Tinker’s Cabin. This building is expected to be where the majority of crafting tasks will be done once a player arrives in Treasure Tides farm. It will hold initially a total of 20 recipes and the longest crafting time will belong to BARGE ANCHOR which will require an 8 hour crafting time. You will find on this post the complete information on each of the recipes including the bushels needed, the crafting time and mastery count. Cannon Balls = Tiarelli Bushel x3, Skull Poppy Bushel x3 and Buccaneer Pumpkin Bushel x3. Ship in Bottle = Sparkle Bubble Bushel x3, Buccaneer Pumpkin Bushel x3 and Toxic Apple Bushel x3. Barge Anchor = Kraken Bloom Bushel x3, Seawave Orange Bushel x3 and Toxic Apple Bushel x3. Crossed Cutlass = Pirate’s Prism Bushel x2, Botanica Bushel x3 and Floral Blush Bushel x2. Eye Patch = Tiarelli Bushel x3, Buccaneer Pumpkin Bushel x3 and Seawave Orange Bushel x2. Pirates Concoction = Botanica Bushel x2, Floral Blush Bushel x2 and Pink Astilbe Bushel x3. Treasure Chest = Pink Astilbe Bushel x3, Floral Blush Bushel x3 and Pirate’s Prism Bushel x2. Treasure Map Pizza = Grape Swirls Bushel x3, Red Torch Tulip Bushel x3 and Kraken Bloom Bushel x3. Cargo Net = Seawave Orange Bushel x2, Seashell Weed Bushel x2 and Toxic Apple Bushel x2. Peacock Quill = Tropical Blooms Bushel x3, Grape Swirls Bushel x3 and Seawave Orange Bushel x3. Pirate’s Goblet = Tropical Blooms Bushel x3, Seawave Orange Bushel x3 and Seashell Weed Bushel x3. Ship Wheel = Tiarelli Bushel x2, Skull Poppy Bushel x2 and Buccaneer Pumpkin Bushel x2. Compass = Oyster Pearl Bushel x3, Grape Swirls Bushel x3 and Sea Sprout Bushel x3. Hat and Bandana = Grape Swirls Bushel x3, Tropical Blooms Bushel x3 and Sea Sprout Bushel x3. Seafarer Flag = Sea Sprout Bushel x3, Oyster Pearl Bushel x3 and Glow Coral Bushel x3. Grog Barrel = Sparkle Bubble Bushel x3, Oyster Pearl Bushel x3 and Xeronema Lily Bushel x3. Mouth Pipe = Xeronema Lily Bushel x2, Larval Anemone Bushel x3 and Sparkle Bubble Bushel x3. Grappling Hook = Glow Coral Bushel x3, Sparkle Bubble Bushel x3 and Oyster Pearl Bushel x3. Seafarer Oars = Kraken Bloom Bushel x2, Larval Anemone Bushel x3 and Xeronema Lily Bushel x3. Spyglass = Hooked Flora Bushel x2, Larval Anemone Bushel x2 and Sparkle Bubble Bushel x3. 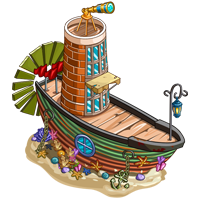 Treasure Map = Sea Sprout Bushel x3, Hooked Flora Bushel x3 and Larval Anemone Bushel x3.